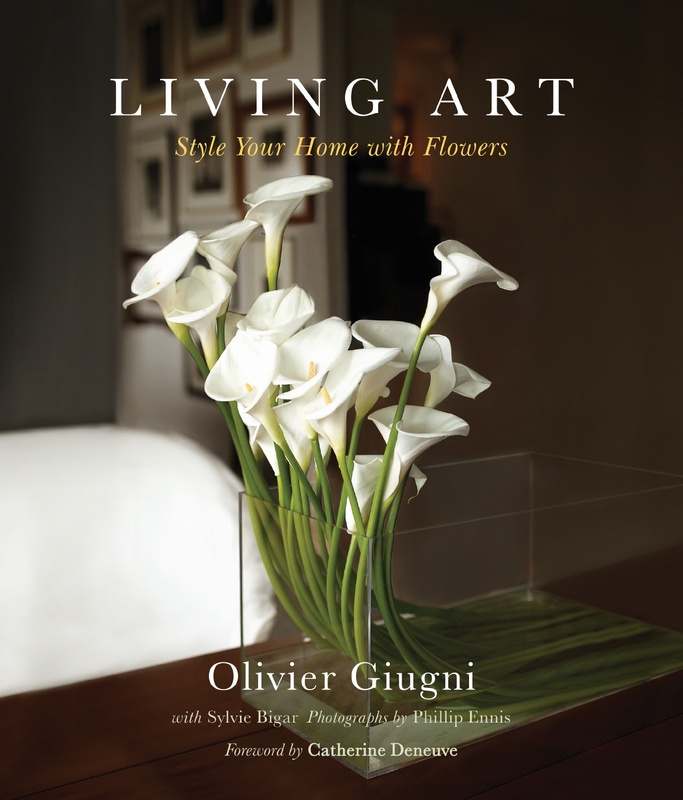 Floral designer to the stars and fabulous impromptu dinner guest, Olivier Giugni, has a wonderful book out: Living Art — Style Your Home with Flowers. You can order it here. Favorite flower? The “sensual” iris. …On weekends I would scour flea markets for antique vases, accessories like feathers, and just about any object with a floral motif. While strolling through the stalls, inspired by my discoveries, I would construct wild new compositions in my head and then deconstruct them until I was satisfied with a final imaginary result. I still do this exercise daily, even on the subway. Now I will tell you a story: Olivier was in Boston last spring to speak at the MFA and promote his book. Mutual friends were visiting for the weekend, and introduced us. A long lunch on Newbury Street followed a few hours later with dinner at our house (I didn’t like the idea of him all alone ordering room service, even if he was holed up at the Taj). At the time, I had no idea of who he was, other than a NYC-based florist with a new book out. Luckily, it was dark when Olivier arrived at our house—making it difficult for him to see much of our garden, other than some enormous yew bushes. I thought Olivier would want them hacked down, but turns out I was projecting—he liked their architectural “presence” and how they made our front porch feel like it was floating. Now that I’ve read his book, I can understand where he was coming from. After dinner, Olivier and I snuck off and walked arm-in-arm around the neighborhood, admiring the neighbors’ gardens and Emerson Park in the moonlight. My French is awful, but à bientôt, mon cher Olivier. Mmmwah!